This year’s Annual Conference was one of the biggest and best that TIS has seen over the years, with over 250 tenant and landlord representatives from across the country gathering in Glasgow. • Lively “Question Time Session” hosted by Brian Taylor, political editor for the BBC. 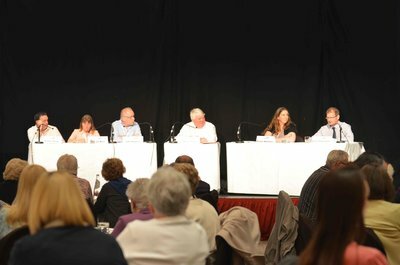 With a panel made up of Jim Hayton, Policy Manager, Association of Local Authorities Chief Housing Officers; Alison Kerr, West Lothian Tenants Movement; Susan Aktemel, Homes for Good, Scotland’s first social enterprise letting agency; Alistair Sharpe, Govan Law Centre; and Martin Pollhammer, Chief Executive of East Lothian Housing Association. • A wide range of workshops on topical housing issues including Planning for Tenant Scrutiny, which looked at how TIS can support tenants and landlords to make tenant scrutiny a reality with its “Scrutiny – Making it Happen Programme” its national scrutiny training and development programme. • Study visits to regeneration initiatives at Queens Cross and New Gorbals Housing Associations and the “Show and Tell” plenary which showcased successful case studies taking place in the TIS projects in East Ayrshire, East Lothian, North and South Lanarkshire Council areas. • Civic reception hosted by the Glasgow City Council, Gala dinner and the Frances Nelson MBE awards. Ilene Campbell , Director, TIS “ We would like to thank all of our sponsors, speakers, exhibitors and the delegates who made our Conference 2013 a success. Our conference provided a platform to highlight the innovative work tenants and landlords are doing to regenerate local communities”. Keep an eye on the TIS website, where we will be uploading the photographs from the Annual Conference in the next few weeks – including those from the ‘photo booth’ which was took place on Saturday evening.